The SFB 1044 hosted this 3-day workshop. The SFB 1044 hosts this annual 4-day event. The SFB 1044 was a sponsor of this 5-week Master Academy. The Collaborative Research Center 1044 at Johannes Gutenberg-University Mainz is funded by the German Research Foundation (DFG). The title of the CRC is The Low-Energy Frontier of the Standard Model: From Quarks and Gluons to Hadrons and Nuclei. Within the CRC 1044 the role of hadrons will be investigated in the context of particle and atomic physics as well as nuclear astrophysics. 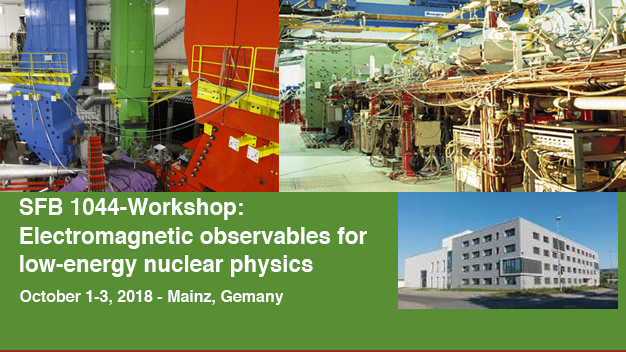 The high-precision measurements and theoretical analyses planned as part of this CRC are carried out by the physicists working with the MAMI electron accelerator in Mainz in cooperation with Chinese colleagues at the Institute of High Energy Physics (IHEP) in Beijing.